Gdańsk on 25th anniversary of Solidarity, summer 2005. The history of Solidarity begins in September 1980, at the Gdańsk Shipyards, where Lech Wałęsa and others formed Solidarity (Polish: Solidarność), a broad anti-communist social movement ranging from people associated with the Catholic Church to members of the anti-communist Left. Solidarity advocated nonviolence in its members' activities. The government attempted to break the union with martial law in 1981, and several years of repressions, but in the end it had no choice but to begin negotiations. The survival of Solidarity was an unprecedented event not only in Poland, a satellite state of the Soviet Union ruled (in practice) by a one-party Communist regime, but the whole of the Eastern bloc. It meant a break in the hard-line stance of the communist Polish United Workers' Party, which had violently ended a 1970 protest with machine gun fire (killing dozens and injuring over 1,000), and the broader Soviet communist regime in the Eastern Bloc, which had quelled both the 1956 Hungarian Uprising and the 1968 Prague Spring with Soviet-led invasions. Solidarity's influence led to the intensification and spread of anti-communist ideals and movements throughout the countries of the Eastern Bloc, weakening their communist governments. In Poland, the Roundtable Talks between the weakened government and Solidarity-led opposition led to semi-free elections in 1989. By the end of August, a Solidarity-led coalition government was formed and in December, Wałęsa was elected president. This was soon followed by the dismantling of the People's Republic of Poland, and the creation of the non-communist, democratic Third Polish Republic. These limited elections, where anti-communist candidates won a striking victory, sparked off a succession of peaceful anti-communist counterrevolutions in Central and Eastern Europe. Solidarity's example was, in various ways, repeated by opposition groups throughout the Eastern Bloc, eventually leading to the Eastern Bloc's effectual dismantling, and contributing to the collapse of the Soviet Union, in the early 1990s. Since 1989, Solidarity has become a more traditional trade union, and had relatively little impact on the political scene of Poland in the early 1990s. A political arm, founded in 1996, as Solidarity Electoral Action (Akcja Wyborcza Solidarność or AWS), would win the Polish parliamentary election, but lose the following Polish parliamentary election of 2001. Currently Solidarity has little political influence in modern Polish politics. The factors contributing to the initial success of Solidarity in particular, and dissident movements in general in the 1970s and 1980s, were the deepening internal crisis of Soviet-style societies due to degradation of morale, worsening economic conditions (shortage economy), and the increasing stress of the Cold War. Economic policy of Polish government, led by First Secretary Edward Gierek, after a brief period of boom, begun to slide into increasing depression from 1975, as the foreign debt mounted. The first strikes took place in June 1976, in Radom and Ursus. After they were stomped out by the government, the worker's movement received support from the intellectual dissidents, many of whom came from the Workers' Defense Committee (Komitet Obrony Robotników, KOR in Polish, formed in 1976). In 1977, KOR was renamed—Committee for Social Self-defense (KSS-KOR). On October 16, 1978, the bishop of Cracow, Karol Wojtyła, was elected Pope John Paul II. A year later, during his first pilgrimage to Poland, millions of Poles attended his masses. The Pope called for respect of national traditions and stressed the importance of freedom and human rights while also denouncing violent action. He was later to define the concept of solidarity in his Encyclical Sollicitudo Rei Socialis (December 30, 1987). The labor strikes did not just occur because of problems that emerged shortly before the unrest, but due to the difficulties of the government and the economy for over ten years. Gdańsk Shipyard, the birthplace of Solidarity. In July of 1980, the government of Edward Gierek, facing an economic crisis, decided to raise the prices while slowing the growth of the wages. A wave of strikes and factory occupations began at once. Although the strike movement had no coordinating center, the workers had developed an information network by which they spread news of their struggles. A group of "dissidents," the Committee for the Defense of Workers (KOR), set up originally in 1976 to organize aid for victimized workers, drew around them small circles of working class militants in major industrial centers. At the Lenin Shipyard in Gdańsk, workers were outraged at the sacking of Anna Walentynowicz, a popular crane operator and well-known activist who became a spark that pushed them into action. On August 14, the shipyard workers began their strike, organized by the Free Trade Unions of the Coast (Wolne Związki Zawodowe Wybrzeża). The workers were led by electrician Lech Wałęsa, a former shipyard worker who had been dismissed in 1976, and who arrived at the shipyard on 1100 on August 14. The strike committee demanded rehiring of Anna Walentynowicz and Lech Wałęsa, raising a monument to the casualties of 1970, respecting of worker's rights and additional social demands. Although government censorship spoke little about sporadic disturbances in work in Gdańsk and soon cut all phone connections from the coast to the rest of Poland, the transmissions of Radio Free Europe penetrating the Iron Curtain and spreading samizdat (bibuła) and grapevine gossip ensured that the ideas of the emerging Solidarity movement spread very quickly throughout Poland. 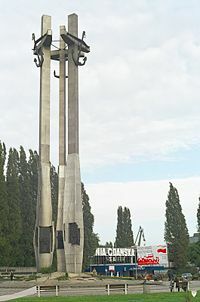 Monument of the fallen Shipyard Workers of 1970 was created in the aftermath of the Gdańsk Agreement, and unveiled on December 16, 1980. On August 16, delegations from other strike committees arrived at the shipyard, with Bogdan Lis and Andrzej Gwiazda. This led to the creation of the Inter-Enterprise Strike Committee (Międzyzakładowy Komitet Strajkowy, MKS) under Lech Wałęsa. On the August 17, a priest, Henryk Jankowski, performed a mass outside the gate of the shipyard, on which 21 demands of MKS were put. No longer concerned simply with immediate local issues, the list began with the demand for new, independent trade unions. It went on to call for relaxation of censorship, the right to strike, new rights for the church, the freeing of political prisoners and improvements in the health service. The next day, a delegation of intelligentsia from KOR arrived, declaring their assistance with negotiations. Among the members of the KOR delegation was Tadeusz Mazowiecki. In the meantime, Mury (Walls) protest song of Jacek Kaczmarski became very popular among the workers. On August 18, the Szczecin Shipyard joined the strike, under the leadership of Marian Jurczyk. The strike wave spread along the coast, closing the ports and bringing the economy to a halt. With the assistance of the activists from KOR and the support of many intellectuals, the workers occupying the various factories, mines, and shipyards across Poland came together. Within days, about 200 factories had joined the strike committee and by August 21, most of Poland was affected by the strikes, from shipyards of the coastal cities to the mines in Silesian Upper Silesian Industrial Area. More and more new unions were formed and joined the federation. By the end of the strike wave, MKS represented over 600 factories from all over Poland. Due to the popular support of the citizens and other striking groups, as well as international support and media coverage, the Gdańsk workers held out until the government gave in to their demands. On August 21, a Governmental Commission (Komisja Rządowa) with Mieczysław Jagielski arrived in Gdańsk, and another one with Kazimierz Barcikowski was dispatched to Szczecin. On August 30 and 31, and September 3, the representatives of the workers and the government signed an agreement, formalizing the acceptance of many of the workers demand, including their right to strike. This agreement came to be known as the August or Gdańsk agreement (Porozumienia sierpniowe). The program, although concerned with trade union matters, allowed citizens to bring democratic changes within the communist political structure and was universally regarded as the first step towards dismantling the Party monopoly. The main concern of the workers was the establishment of a trade union independent of communist party control and the legal right to strike. In creating these new groups, there would be a clear representation of the workers’ needs. Another consequence of the Gdańsk Agreement was the replacement of Edward Gierek by Stanisław Kania in September 1980. 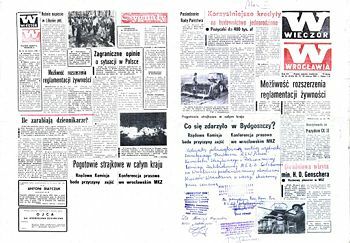 Wieczór Wrocławia—daily newspaper of Wrocław, Poland, edition of March 20-21-21, 1981, with censorship intervention on first & last pages (under headline "Co zdarzyło się w Bydgoszczy? Pogotowie strajkowe w całym kraju" ("What happened in town Bydgoszcz? Strike alert in whole country"). Workers in the printing house decided to print this newspaper with the friar instead of text confiscated by censor. There is the original confirmation of "Solidarność" Trade Union on this copy of newspaper. It says the printing house chapel has decided to print this newspaper in this form. Buoyed by the success of the strike, on the September 17, the representatives of Polish workers, including Lech Wałęsa, formed a nationwide trade union, Solidarity (Niezależny Samorządny Związek Zawodowy "Solidarność"). The name was proposed by Karol Modzelewski, and the famous logo was designed by Jerzy Janiszewski, designer of many Solidarity-related posters. On December 16, 1980, the Monument to fallen Shipyard Workers was unveiled. On January 15, 1981, a delegation from Solidarity, including Lech Wałęsa, met Pope John Paul II in Rome. Between September 5 and 10 and September 26 to October 7, the first national congress of Solidarity was held, and Lech Wałęsa was elected its president. In the meantime, Solidarity was transforming from a trade union into a social movement. Over the next 500 days, following the Gdańsk Agreement, 9 to 10 million workers, intellectuals, and students joined it or its suborganizations (like Independent Students Union, Niezależne Zrzeszenie Studentów, created in September 1980, or "Rural Solidarity," NSZZ Rolników Indywidualnych "Solidarność," a union of farmers, created in May 1981). It was the first and only recorded time in the history that a quarter of a country's population have voluntarily joined a single organization. "History has taught us that there is no bread without freedom," the Solidarity program stated a year later. "What we had in mind were not only bread, butter, and sausage but also justice, democracy, truth, legality, human dignity, freedom of convictions, and the repair of the republic." Using strikes and other protest actions, Solidarity sought to force a change in the governmental policies. At the same time, it was careful to never use force or violence, to avoid giving the government any excuse to bring the security forces into play. After over 27 Solidarity members in Bydgoszcz were beaten up on March 19, a 4-hour strike on March 27, the largest strike in the history of the Eastern bloc paralyzed the entire country and forced the government to promise that the investigation into the beatings will be carried out. The Communist Party of Poland—Polish United Workers Party (PZPR) lost its control over the society. Yet, while Solidarity was ready to take up negotiations with the government, the Polish communists were unsure what to do, issuing empty declarations and biding their time. In the background of deteriorating communist shortage economy and unwillingness to seriously negotiate with Solidarity, it became increasingly clear that the Communist government would eventually have to suppress the movement as the only way out of the impasse, or face a truly revolutionary situation. In the increasingly tense atmosphere, on December 3, the Solidarity declared that a 24-hours strike would be held if the government was granted additional prerogatives for suppressing dissent, and that a general strike would be declared if those prerogatives entered into use. After Gdańsk Agreement, the Polish government was under increasing pressure from Moscow to take action and strengthen its position. Stanisław Kania was viewed by Moscow as too independent, and so on October 18, 1981, the Central Committee of the Party put him in minority. Kania lost his post as general secretary, replaced by Prime Minister (and Minister of Defence) Gen. Wojciech Jaruzelski, who adopted a strong-arm policy. On December 13, 1981, the government leader Wojciech Jaruzelski started a crack-down on Solidarity, declaring martial law and creating a Military Council of National Salvation (Wojskowa Rada Ocalenia Narodowego, WRON). Solidarity's leaders gathered at Gdańsk were interned and isolated in facilities guarded by Służba Bezpieczeństwa, and thousands of Solidarity's supporters were arrested in the middle of the night. There were a couple of hundred strikes and occupations, chiefly in the largest plants and in several of the Silesian coalmines, but they were broken by paramilitary riot police ZOMO. 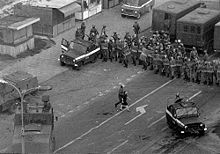 One of the largest demonstrations, on December 16, 1981, took place at Wujek Mine, where government forces opened fire on the demonstrators, killing 9 and injuring 21. The next day, during protests in Gdańsk, government forces also fired at the demonstrators, killing 1 and injuring 2. By December 28, strikes had ceased, and Solidarity appeared crippled. Solidarity was decertified and banned on October 8, 1982. The international community from outside Iron Curtain condemned Jaruzelski's action, declaring support for Solidarity. U.S. President Ronald Reagan imposed economic sanctions on Poland, and the CIA provided funds for the underground Solidarity. The Polish public also supported the remains of the Solidarity; one of the largest demonstrations of support for Solidarity became religious ceremonies, such as masses held by priests like Jerzy Popiełuszko. Martial Law was formally lifted in July 1983, though many heightened controls on civil liberties and political life, as well as food rationing, remained in place through the mid- to late 1980s. The murder of Jerzy Popiełuszko, a popular priest, sparked off a large wave of protests in 1984. On April 22, 1982, Zbigniew Bujak, Bogdan Lis, Władysław Frasyniuk, and Władysław Hardek created the Temporary Coordinating Committee (Tymczasowa Komisja Koordynacyjna), which served as an underground leadership of Solidarity. On May 6, another underground Solidarity organisation (Regional Coordination Committee of NSSZ "S"—Regionalna Komisja Koordynacyjna NSZZ "S") was created by Bogdan Borusewicz, Aleksander Hall, Stanisław Jarosz, Bogdan Lis, and Marian Świtek. In June, the Fighting Solidarity (Solidarność Walcząca) organization was created. Throughout the mid-1980s, Solidarity persisted solely as an underground organization, supported by the Church and the CIA. All of its activists were pursued by Służba Bezpieczeństwa, but still managed to strike back: On May 1, 1982, a series of anti-government protests gathered thousands of people (several dozens of thousands in Gdańsk). The protests took place again on May 3, during the festivities celebrating the Polish Constitution of May 3. More strikes took place in Gdańsk, from October 11 to 13, and again in May of the following year. Lech Wałesa was released on November 14, 1982, but on December 9, the SB carried out a large anti-Solidarity action, arresting over 10,000 Solidarity activists. On December 27, all of Solidarity's assets were transferred to the official, pro-government trade union, All-Polish Agreement of Trade Unions (Ogólnopolskie Porozumienie Związków Zawodowych, OPZZ). Martial law was lifted on July 22, 1983, and an amnesty was given to many imprisoned members of the trade union, who were released from imprisonment. On October 5, Lech Wałęsa received the Nobel Prize for Peace, but the Polish government still refused to issue him a passport and allow him to leave the country; the award was received in his name by his wife. It was later revealed that SB had prepared fake documents accusing Wałęsa of various immoral and illegal activities—these were given to the Nobel committee in an attempt to derail the Wałęsa nomination. 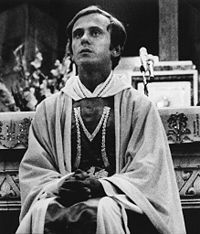 On October 19, 1984, three agents of the Ministry of Internal Security murdered a popular pro-Solidarity priest, Jerzy Popiełuszko. As the truth about the murder was revealed, thousands of people declared solidarity with the priest by attending his funeral on November 3, 1984. Frasyniuk, Lis, and Adam Michnik, members of the underground "S," were arrested on February 13, 1985, and sentenced to several years of imprisonment. During the trial, the judge had denied the accused the right to consult with their defense lawyers. A meeting between USSR General Secretary Mikhail Gorbachev and U.S. President Ronald Reagan, the sign of improved relations between East and West. On March 11, 1985, the Soviet Union found itself under the rule of Mikhail Gorbachev, a leader representing a new generation of Soviet party members. The worsening economic situation in the entire Eastern Bloc, including the Soviet Union, forced Gorbachev to carry out several reforms, not only in the field of economics (perestroika), but also in political and social structure (glasnost). His policies soon caused a mirror shift in the politics of Soviet satellites, such as the People's Republic of Poland. On September 11, 1986, 225 political prisoners in Poland were released. On September 30, Lech Wałęsa created the first public and legal Solidarity structure since the declaration of martial law, the Temporary Council of NSZZ Solidarność (Tymczasowa Rada NSZZ Solidarność), with Bogdan Borusewicz, Zbigniew Bujak, Władysław Frasyniuk, Tadeusz Jedynak, Bogdan Lis, Janusz Pałubicki, and Józef Pinior. Many local Solidarity chapters then revealed themselves throughout Poland, and on October 25, 1987, the Country Executive Committee of NSZZ Solidarność (Krajowa Komisja Wykonawcza NSZZ Solidarność) was created. Nonetheless, the Solidarity members and activists were still persecuted and discriminated against (albeit to a lesser extent than during the early 1980s), and there was a deepening divide between the Wałęsa faction, which wanted to negotiate with the government, and a more radical faction planning for an anti-communist revolution. "High Noon, 4 June 1989"
By 1988, the economy was in a worse state than it had been eight years earlier. International sanctions combined with the government lack of will to reform intensified the old problems. Inefficient national enterprises in the planned economy wasted labor and resources, producing substandard goods for which there was little demand. Polish exports were low, both because of the sanctions and because its goods were as unattractive abroad as at home. There was no capital investment to modernize the factories, resulting in a shortage economy with long lines and empty shelves. The reforms of Mieczysław Rakowski were too little and came too late. The changes in the Soviet Union increased social expectations but the Soviets had no will to prop their failing puppet state regime in Poland. On April 21, 1988, a new wave of strikes hit the country, starting in the Stalowa Wola Steelworks. On May 2, workers from Gdańsk Shipyard joined the strike. That strike was broken by the government from May 5 to 10, but only temporarily; a new strike took place in the "July Manifest" mine in Jastrzębie Zdrój on August 15. The strike spread to many other mines by August 20, and on 22 the Gdańsk Shipyard joined the strike as well. The Polish communist government at that time decided to negotiate. On August 26, Czesław Kiszczak, Minister of Internal Affairs, declared on television that the government was willing to negotiate, and 5 days later he met with Wałęsa. The strikes ended the following day, and on October 30, during a television debate between Wałęsa and Alfred Miodowicz (leader of pro-government trade union, the All-Polish Agreement of Trade Unions (Ogólnopolskie Porozumienie Związków Zawodowych, OPZZ) Wałęsa scored a public relations victory. On December 18, a 100-member strong Citizen's Committee (Komitet Obywatelski) had been created at NSZZ Solidarność. It was divided into several sections, each responsible for presenting a specific aspect of opposition demands to the government. Some members of the opposition, supported by Wałęsa and most of the Solidarity leadership supported the negotiations, although there was some opposition from the minority which wanted an anti-communist revolution. Nonetheless Solidarity under Wałęsa's leadership decided to pursue a peaceful solution, and the pro-violence faction never had any significant power. In January 27, 1989, during a meeting between Wałęsa and Kiszczak the membership of the main negotiations teams were decided. In the negotiations, known as the Polish Round Table Agreement, 56 people would take part: 20 from "S," 6 from OPZZ, 14 from PZPR, 14 "independent authorities," and two priests. 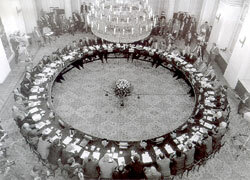 The Polish Round Table Talks took place in Warsaw, Poland from February 6 to April 4, 1989. The Polish Communists, led by Gen. Jaruzelski, hoped to co-opt prominent opposition leaders into the ruling group without making major changes in the political power structure. In reality, the talks radically altered the shape of the Polish government and society. Solidarity was legalized as the Solidarity Citizens' Committee (Komitet Obywatelski "Solidarność") and allowed to participate in the Polish legislative elections (1989). Election law allowed Solidarity to put forward candidates for only 35 percent of the seats in parliament Sejm, but there were no restrictions for the Senate candidates. Agitation and propaganda continued legally up to voting day. On May 8, the first issue of a new, pro-Solidarity newspaper, Gazeta Wyborcza (Voting Gazette), was published. Posters with Lech Wałęsa supporting various candidates could be seen throughout the country. Pre-election public opinion polls promised victory to the Polish communists, but soon after the first round of elections, it became evident that Solidarity fared extremely well, capturing 160 out of 161 contested Sejm seats, and 92 out of 99 Senate ones. After the second turn, it had won virtually every single seat—161 in Sejm, 99 in Senate. The total defeat of PZPR and its satellite parties came as a surprise to everyone involved. The new Contract Sejm, named so after the agreement reached by the communist party and the Solidarity movement during the Polish Round Table Agreement, would be dominated by Solidarity. On June 23, a Citzen's Parliamentary Club "Solidarity" (Obywatelski Klub Parlamentarny "Solidarność") was formed, led by Bronisław Geremek. This club formed a coalition with two former satellite parties of PZPR: ZSL and SD, which chose this time to "rebel" against PZPR, which found itself in the minority. On August 24, Sejm chose Tadeusz Mazowiecki, a Solidarity representative, to become Prime Minister of Poland. He was a first non-communist Polish Prime Minister since 1945. In his speech, he talked about the "thick line" (Gruba kreska) which would separate his government from the communist past. By the end of August, a Solidarity-led coalition government was formed. Leszek Balcerowicz, Solidarity's expert on economics, was the author of the Balcerowicz Plan. The fall of the communist regime marked a new chapter in the history of Poland as well as in the history of Solidarity. Having defeated the communist government, Solidarity found itself in a role it was much less prepared for, that of a ruling political party. Soon after, Solidarity's popularity began eroding. Conflicts between various factions inside Solidarity intensified, as seen in the disputes during the April (20-25) 1990 meeting of Solidarity delegates in Gdańsk. Wałęsa was elected the chairman of Solidarity, but his support eroded, while one of his main opponents, Władysław Frasyniuk, withdrew from elections altogether. In September Walesa declared that Gazeta Wyborcza had no right to use the Solidarity logo. Later that month, he declared his intentions to run in the Polish presidential election (1990). In December, Wałęsa was elected president, resigning from his post in Solidarity and becoming the first President of Poland elected by popular vote. The following year, in February, Marian Krzaklewski was elected the leader of Solidarity. As President Wałęsa's visions and that of the new Solidarity leadership were diverging. Far from supporting him, Solidarity was becoming increasingly critical of the government and decided to create its own political party for the Polish parliamentary election (1991). That election was characterized by a very high number of competing parties, many claiming the legacy of anti-communism; NSZZ "Solidarność gained only 5 percent of total vote. On January 13, 1992, Solidarity declared its first strike against the democratic government: A one hour strike against the proposed raise in prices of energy. Another two hour strike took place on December 14. On May 19, 1993, deputies of Solidarity proposed a motion of no confidence for the government of prime minister Hanna Suchocka, which passed. Rather than accept the resignation of the prime minister, President Wałęsa disbanded the parliament. Jerzy Buzek of Akcja Wyborcza Solidarność became the premier of Poland in late 1990s. In the resulting Polish parliamentary election of 1993, it became evident how much Solidarity's support had eroded during the previous three years. Even though some among the Solidarity tried to distance themselves from the right-wing government and assume a more left-wing stance, Solidarity was still identified with the government and suffered from the increasing disillusioment of the population, as transition from communist to a capitalist system failed to raise living standards substantially, while the shock therapy (Balcerowicz's Plan) generated much opposition. In the elections Solidarity received only 4.9 percent, 0.1 percent below the required 5 percent to enter the parliament (it still had 9 senators, 2 fewer then in the previous Senate of Poland). The victorious party was the Sojusz Lewicy Demokratycznej (Democratic Left Alliance)—a post-communist left-wing party. In an ironic twist, Solidarity joined forces with its past enemy, the All-Polish Agreement of Trade Unions (OPZZ), and some of the protests were organized by both trade unions. In the following year, Solidarity organized many strikes related to the situation of Polish mining industry. In 1995, a demonstration in front of the Polish parliament was broken by police (now known as Policja), using batons and water guns. Nonetheless Solidarity decided to support Lech Wałesa in the Polish presidential election (1995). In a second major defeat for the Polish right-wing, the elections were won by a SLD candidate, Aleksander Kwaśniewski, who got 51.72 percent of the vote. Solidarity's call for the new elections went unheeded, but the Polish Sejm still managed to pass a motion condeming the 1981 martial law (despite SLD voting against it). In the meantime, the left-wing OPZZ trade union had acquired 2.5 millions members, over twice as many as the contemporary Solidarity (with 1.3 millions). In June 1996, the Akcja Wyborcza Solidarność (Solidarity Electoral Action) was founded as a coalition of over 30 right-wing parties, uniting liberal, conservative and Christian democratic forces. It was victorious in the Polish parliamentary election (1997) and Jerzy Buzek became Prime Minister. However, controversy over the reforms relating to domestic affairs, the entry into NATO in 1999, and the accession process to the European Union, combined with much infighting within the party the AWS and corruption (the famous TKM slogan) eventually resulted in the loss of much public support. AWS leader Marian Krzaklewski, lost in the Polish presidential election (2000) and in Polish parliamentary election (2001) AWS failed to elect a single deputy to the parliament. Currently, Solidarity has around 1.5 million members but has a negligible political significance. In its mission statement it declares that: "[Solidarity]… basing its activity on Christian ethics and Catholic social teachings, conducts activity to protect workers' interests and fulfills their material, social, and cultural aspirations." ↑ 1.0 1.1 Manfred B. Steger, Judging Nonviolence: The Dispute Between Realists and Idealists (Routledge, 2004, ISBN 0-415-93397-8), p. 114. ↑ Paul Wehr, Guy Burgess, and Heidi Burgess (eds. ), Justice Without Violence (Lynne Reinner Publishers, 1994, ISBN 1-55587-491-6), p. 28. ↑ 3.0 3.1 3.2 3.3 3.4 3.5 3.6 3.7 3.8 International Socialism, The rise of Solidarnosc. Retrieved July 10, 2006. ↑ BBC News, The birth of Solidarity. Retrieved July 10, 2006. ↑ Douglas J. MacEachin, U.S. Intelligence and the Confrontation in Poland, 1980-1981 (Penn State Press, 2004, ISBN 0-271-02528-X). ↑ William D. Perdue, Paradox of Change: The Rise and Fall of Solidarity in the New Poland (Praeger/Greenwood, 1995, ISBN 0-275-95295-9), p. 9. ↑ Peter Schweizer, Victory: The Reagan Administration's Secret Strategy That Hastened the Collapse of the Soviet Union (Atlantic Monthly Press, 1996, ISBN 0-87113-633-3), p. 86. ↑ George Weigel, The Final Revolution: The Resistance Church and the Collapse of Communism (Oxford University Press, 2003, ISBN 0-19-516664-7), p. 149. ↑ Paul A. Kubicek, Unbroken Ties: The State, Interest Associations, and Corporatism in Post-Soviet Ukraine (University of Michigan Press, 2000, ISBN 0-472-11030-6), p. 188. ↑ solidarnosc.org, Homepage. Retrieved July 10, 2006. Ash, Timothy Garton. The Polish Revolution: Solidarity. Yale University Press, 2002. ISBN 0-300-09568-6. Eringer, Robert. Strike for Freedom: The Story of Lech Walesa and Polish Solidarity. Dodd Mead, 1982. ISBN 0-396-08065-0. Kenney, Patrick. A Carnival of Revolution: Central Europe 1989. Princeton University Press, 2003. ISBN 0-691-11627-X. Kenney, Patrick. The Burdens of Freedom. Zen Books Ltd, 2006. ISBN 1-84277-662-2. Osa, Maryjane. Solidarity and Contention: Networks of Polish Opposition. University of Minnesota Press, 2003. ISBN 0-8166-3874-8. Ost, David. The Defeat of Solidarity: Anger and Politics in Postcommunist Europe. Cornell University Press, 2005. ISBN 0-8014-4318-0. Penn, Shana. Solidarity's Secret: The Women Who Defeated Communism in Poland. University of Michigan Press, 2005. ISBN 0-472-11385-2. Perdue, William D. Paradox of Change: The Rise and Fall of Solidarity in the New Poland. Praeger/Greenwood, 1995. ISBN 0-275-95295-9. All links retrieved October 10, 2015. The Birth of Solidarity BBC. The rise of Solidarnosc, Colin Barker, International Socialism, Issue: 108. History of "Solidarity (History of)"
This page was last modified on 12 October 2015, at 20:01.